28 Sep Why Use a Certified Arborist? 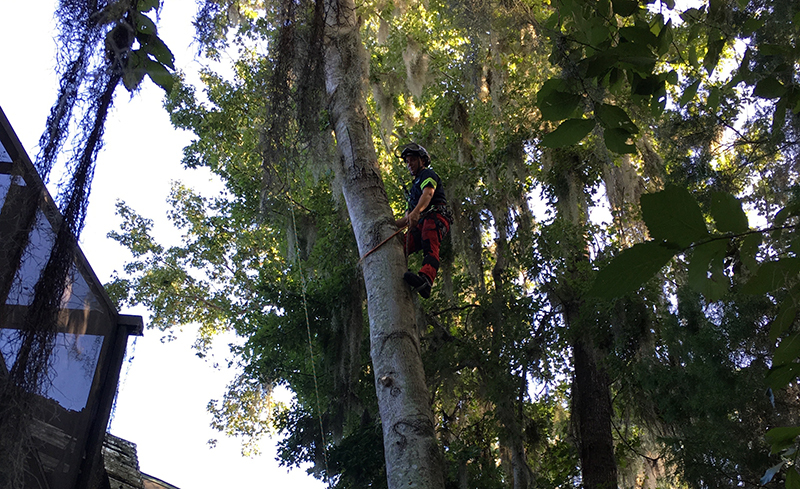 Why should you hire a certified arborist when looking for emergency tree service in Jacksonville and St. Augustine? It comes down to two key factors: knowledge and experience. Arborists are highly trained specialists who have been educated in the science of tree care. A certified arborist is someone who has been certified by the International Society of Arboriculture and typically has many years of experience caring for trees. Additionally, they have passed a comprehensive exam to demonstrate their advanced knowledge of how to plant, care for and maintain trees. An experienced arborist can tell you how to trim your trees to maintain their appearance, keep them healthy, and prevent unsafe situations. An arborist takes into account the growth patterns of different trees, the unique needs of each variety of tree, and the right method to trim them back without causing damage. Pruning includes the removal of limbs that are too close to utilities or structures, dead or decaying, insect-infested, have storm damage or are causing an obstruction. Most people hope not to have to remove a tree, but sometimes it is unavoidable. Our tree surgeons and certified arborists can tell you if your tree is dead or dying, poses a safety hazard, causes an obstruction, or is crowding and harming other trees. Emergency tree removal in Jacksonville or St. Augustine is quite common as a result of storm damage. Strong winds and rain can cause limbs or trees to fall. Often they fall on electric and utility lines, buildings, cars, or other trees. Since this can be a dangerous situation, it’s crucial to have a certified arborist handle this type of tree removal. Look for a company that offers 24-hour emergency service like TREECO so that you can have hazardous situations taken care of immediately. Certified arborists can diagnose tree disease, decay, weakness, fungus and pest problems. Proper tree care prevents problems and helps to maintain healthy trees.